ASHBURN, VA--(Marketwired - Aug 14, 2014) - Airbus Defense and Space, Inc. recently hosted a successful demonstration of its SONEX-P threat detection system to representatives of major international airports, homeland security agencies, and federal, state, and local law enforcement organizations. Attendees included representatives of the Metropolitan Washington Airports Authority, Pennsylvania State Police, Virginia State Police, and the Domestic Nuclear Defeat Organization. During the demonstration, which was held at the Airbus Group storage facility, SONEX-P accurately detected and identified a range of hidden explosive threats -- each in a single scan. What sets SONEX-P apart is its combination of neutron technology with 3D imaging, enabling faster threat detection and more accurate views of a threat compared to X-ray based detection devices. The system's 3D imaging capability and laptop interface allows first responders to interrogate suspicious packages from a safe distance without handling them. The system software is fully customizable and can be optimized to detect other emerging chemical, nuclear and radiological threats. Easy to use, SONEX-P also eliminates the need for lengthy training to interpret readings. The device does all the work -- signaling a live threat with a red light on its console and a non-threat condition with a green light. "SONEX-P is automatic detection of threats," said Michael Cosentino, president of Airbus Defense and Space, Inc.
"The SONEX-P system represents the future of threat detection; faster results, clearer views of the threat and a greatly improved degree of safety for first responders and explosives technicians," he added. Weighing about 50 pounds, SONEX-P is lightweight, and comprised of only two elements -- a man-portable detection head and a companion laptop computer -- that work in tandem to identify, detect and discriminate chemical, radiological, nuclear or explosive threats located in parcels, luggage, ordnance or abandoned bags. 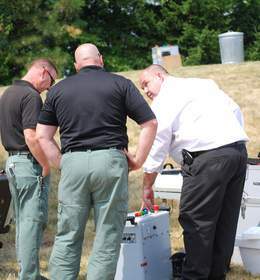 About this company Airbus Defense and Space, Inc.
Law enforcement professionals examine the new SONEX-P explosives detection system during an Airbus Defense and Space Inc. demonstration. The event drew representatives from major international airports, homeland security agencies, and law enforcement.